(Lionel Cironneau and Michel Euler | The Associated Press) At left is a1987 file photo of Notre Dame Cathedral in Paris and at right is an image from April 15, 2019 of Notre Dame on fire. Firefighters declared success Tuesday April 16, 2019 morning in an over 12-hour battle to extinguish an inferno engulfing Paris' iconic Notre Dame cathedral that claimed its spire and roof, but spared its bell towers. Paris • Authorities are assessing the stability of Notre Dame Cathedral after a fire ripped through the iconic monument in central Paris and seriously damaged large parts of the structure. 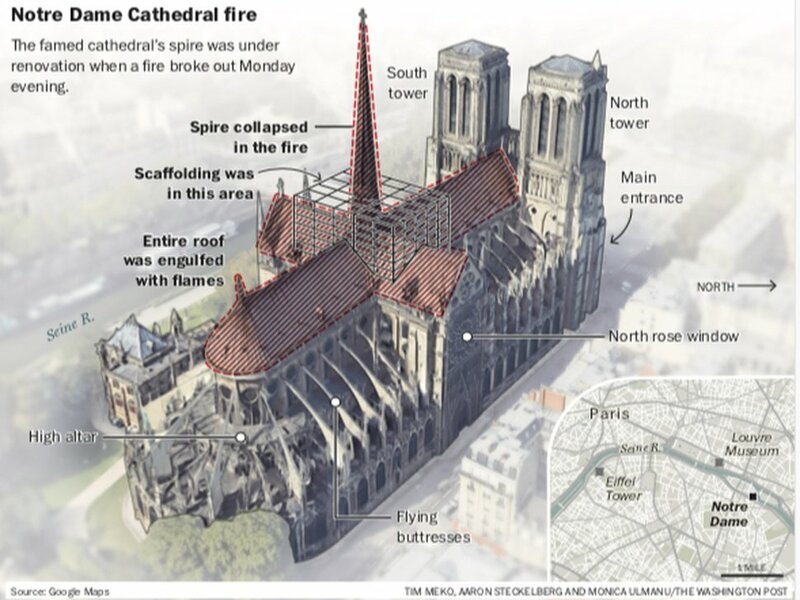 "Fire risk being now removed, it's now about the building itself," deputy interior minister Laurent Nunez said early Tuesday morning after visiting the iconic 850-year-old Gothic monument. Firemen were still hosing the south side of the transept to cool down the building, and a district around the cathedral was sealed, as military and police patrolled the area. Experts met at 8 a.m. local time to determine if the building structure is stable and if firemen can now work inside to cool the building, Nunez said. (The Washington Post) The Notre Dame Cathedral's spire was being renovated when a fire started Monday evening in Paris. President Emmanuel Macron late Monday evening vowed to rebuild the cathedral after it was ravaged in the fire, leaving France in shock over the extensive damage to one of the nation’s most iconic landmarks. The president called for donations and said he would draw on the world’s best talents for the task. Paris Mayor Anne Hidalgo suggested an international donors office. Money has already started to arrive for a rebuilding that will take years if not decades. The Paris region has unblocked 10 million euros ($11.5 million) in emergency funding. The Pinault family of Gucci owner Kering announced it was giving 100 million euros and the Arnault family that controls LVMH said it pledged 200 million euros. The blaze raged for more than four hours before Macron declared the two bell towers and facade had been saved. Flames had engulfed the roof, snaking up the ornate spire before it collapsed as smoke billowed out into the evening skyline of the French capital. More than 400 firefighters battled the inferno. The cause of the fire is still unknown. Paris prosecutors opened a non-criminal investigation Monday night, a routine step in such a major incident. The roof of the monument was under restoration and partially covered in scaffolding. "We will rebuild Notre-Dame because that's what the French people want," said Macron, who was visibly moved. "That's what our history deserves, because that is our destiny." The historic church, located on one of two islands in the middle of the Seine River, had been under renovation and scaffolding had covered much of the top structure. Live television images transfixed viewers around the world and Macron postponed a major speech as flames tore through the cathedral that has towered over Paris for centuries. It had come through long-range German bombardment during World War I and was spared damage during World War II. Bystanders including priests were cordoned off from the blaze on Monday, with many singing and praying, or standing by in silent disbelief. Thousands of people were evacuated from the building after the fire broke out and hundreds of onlookers remained on the scene as ashes fell onto surrounding streets. At least one fire fighter was seriously injured. Early Tuesday, it was still unclear what exactly had been saved from inside the church, Paris Archbishop Michel Aupetit said on BFM. He said the treasury had been saved, including a crown of thorns that Louis IX is reputed to have brought from the Holy Land in the 13th century, and that the organ appears to have escaped major damage. "But some things are attached to walls and couldn't be taken out and I don't know what shape they are in," he said. The fire devastated a center of French Catholicism where some of the nation's historical events were celebrated. Construction got underway in the 12th century, though the current structures are mostly the result of renovations carried out in the 19th century following damage during the French Revolution. Bloomberg’s Vidya Root, James Regan, Adveith Nair and Tara Patel contributed.